Weather you're a pirate or space ranger there's nothing like a great sandwich. The simple combination of wholesome bread, tender meats and flavorful sauces can be nothing short of spectacular, especially when crafted at a Disney Park. So batten down the hatches and prepare for this month's Average Disney Dude's Top 5! Here we go! Often overshadowed by the unique cupcake offerings at Starring Rolls Cafe, this HUGE sandwich is not only tasty but filling! Just check out the huge chunk of black forest ham you get! Yummy! It's paired with chips or fresh fruit to round out a great meal. A sandwich for carnivores! Succulent roast beef with creamy blue cheese and an onion roll. I'm a real sucker for bleu cheese and with a generous helping of roast beef and that sweet onion it really complements each other - the sweet and savory! 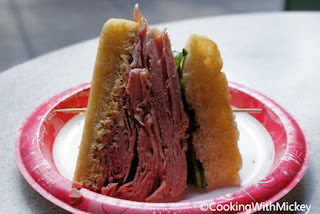 I was really impressed with this sandwich and after the first bite I was surprised to get such flavor, especially from the Pop Century food court. The sandwich alone keeps me coming back. There are so many things to love about New Orleans... the jazz, the art and most importantly, for the sake of this article, the FOOD! Not only will you be seduced by all of those aforementioned qualities as you step foot into the Jazz Kitchen but you will be overwhelmed by the sights and smells of the wonderful food! 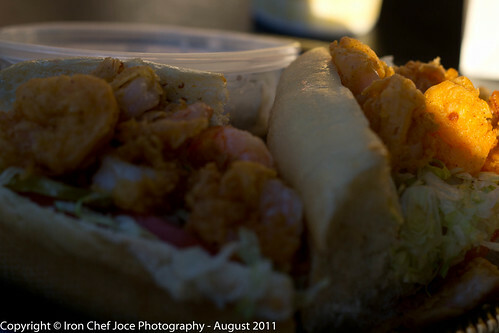 Take for example the Shrimp BLT Po-Boy. Crispy Gulf shrimp, applewood smoked bacon, Cajun tartar sauce, Cajun fries is just a taste of the magic of New Orleans - oh so magical! 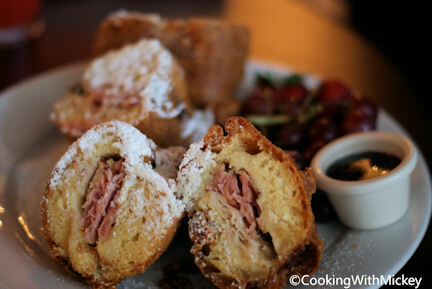 Nobody does a Monte Cristo like Disneyland. Nobody. This sandwich is stuff legends are made of. This 8th wonder of the "world" has got sliced turkey, ham and Swiss cheese fried in a light batter and served with berry puree dusted with Powdered Sugar. Sure it's pricey but it's so worth the price of admission. This attraction is large enough to share so feel free to save a slice for me! In 1762, John Montagu, the 4th Earl of Sandwich, had his hands full, literally. He was the First Sea Lord of the mighty British Navy, a noted explorer, a patron of the arts and also a dedicated gambler with a love of daylong card games. This led to little time for food, so he came up with the ingenious idea of putting meat between two slices of bread. From then on it did not matter if you were inspecting the Fleet or laying down a Royal Flush you could eat great food without too much fuss. Thus the sandwich was named after its inventor the 4th Earl of Sandwich in 1762. Now over 240 years on, the family, now headed by John Montagu, the 11th Earl of Sandwich has reclaimed and reinvented the greatest of all quick foods. The Earl of Sandwich is dedicated to bringing the sandwich we've all been waiting for. Our signature hot Roast Beef Sandwich, served on hearth baked bread will amaze you. We also serve classic cold sandwiches and wraps, unique salads, fresh fruit smoothies and our very own ice cream sandwiches. We feel honored that so many have copied our lead but we are here to reclaim the sandwich. I know this sandwich is only available during the holidays, however it is WORTH the wait. The oven-roasted turkey, savory stuffing with gravy, seasoned mayo and whole cranberries is everything you love about a holiday feast in between a toasty bun. What's not to love about it? This sandwich has the ability to stop war so do yourself a favor and pick up this miracle sandwich while you get a chance! There you have it! 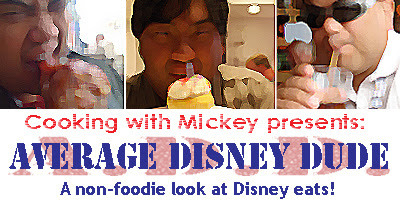 Another Top 5 list from me, the non-Disney foodie. Do you have a favorite sandwich at the Disney Parks or Disney Cruise Line? Please leave me some feedback so I can research your favorite! Until next time Happy Holidays and keep it real! That Holiday sandwich is to die for! I'd LOVE to try that... maybe it'll still be around in February! Ha! I'd love to try the Holiday sandwich too (hold the cranberries though)! Reminds me of the sandwich Monica made on Friends. Remember the one with the "moist maker"?